My husband doubted me on this one. He thought the chips would get, "...soggy." is to tell me it can't be done. Heat 1/2 tablespoon of butter in a pan over medium heat, once bubbling carefully add your sandwich. Lightly press the sandwich down with a spatula or here I used a pot lid just to apply a little pressure to the sandwich. Again, apply light pressure to the sandwich. I would have never thought to put these ingredients together! 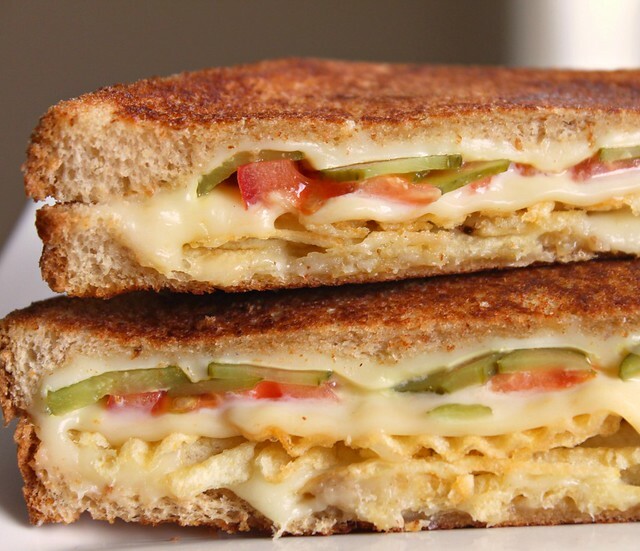 pickles on my grilled cheese? potato chips? I'm intrigued and surprisingly want to try this out! 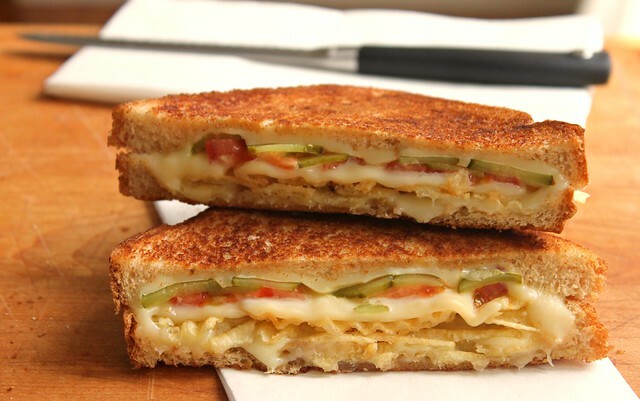 Now that is a grilled cheese sandwich. I will give this a try tonight! hahaha, I am the same way. If you tell me it can't be done, I will do it so fast! This sounds sooo good! That is a great looking sandwich and the chips certainly kick it up a notch - I must try it. Great shot of it too. Wow! My mouth is literally watering, looking at this photo! I definitely want to give this a try. One of my favorite sandwiches has BBQ potato chips in it....this is right up my alley. Yum! Thanks for the comments all :) I want to make these again soon...with ham too! 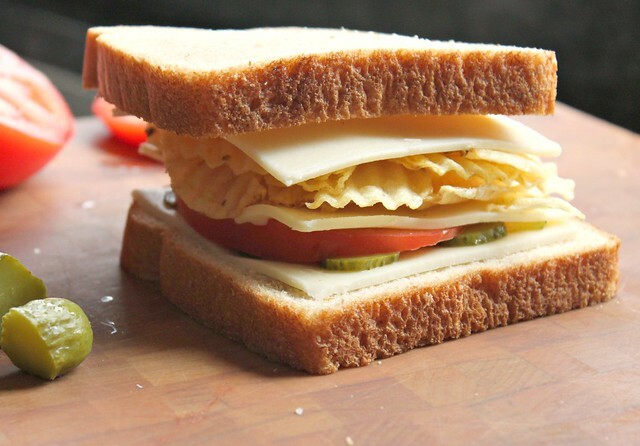 My sister used to do that, put potato chips and french fries inside her sandwiches and hamburgers. 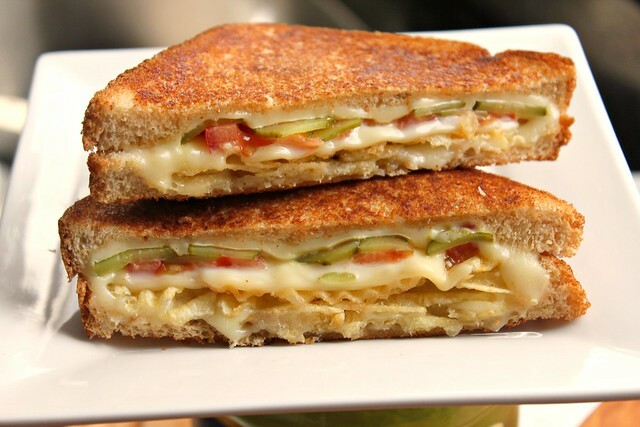 I must say that grilled cheese looks incredible and it is amazing how crisp the chips look beneath all that oozy cheese. 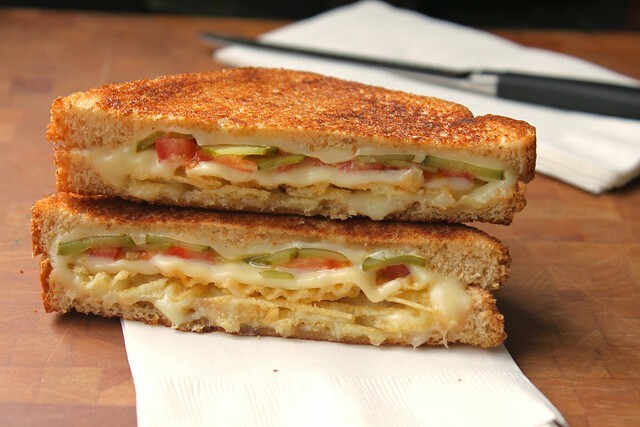 Oh my, that does look like an amazing grilled cheese! My husband is a potato chip fanatic - he would love this. I Stumbled onto this page about 25 minutes ago and thought "Why not?" I just happened to have all of the ingredients in (although I used Emmental cheese slices) and decided it would do very nicely for my tea. Overall a success! It was my first proper grilled cheese sandwich (I'm British), which was interesting. The filling was very tasty, though I did find my (ridged, cheese and onion) crisps didn't hold their crunch as much as I would have liked. I also wasn't very keen on the outermost component. A delicious filling sandwiched between two slices of full English breakfast style fried bread? I found it overly greasy and it detracted from the gently oozing cheese filling. Perhaps I didn't get the butter hot enough (I didn't want it to burn) and as a result it penetrated too far into the bread, or maybe I just needed to use less butter than the recipe called for. I think I will definitely use this filling again, but I'll try and find a way to scale right back on the amount of fat used for cooking - digging out my parents' old cheese toastie machine might be the way to go. 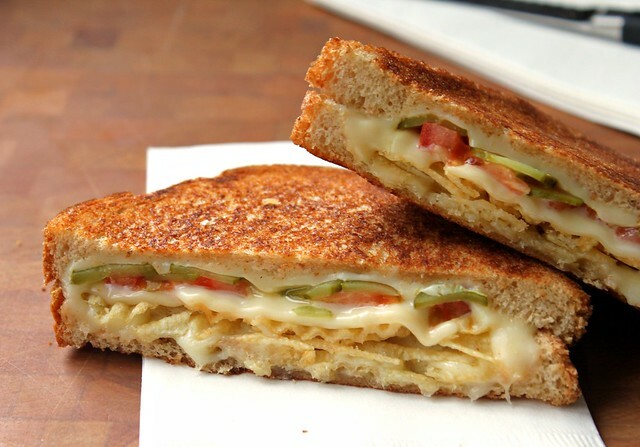 I just made several combinations of grilled cheese sandwiches last Sunday for a little "gathering". Darn, I wish I would have seen this sooner, I would have thrown it into the mix. Sounds delicious and would make for great conversation. I love pickles in anything.